As a boy, when being in church, John Dierickx tried to capture the moments of ecstatic rapture he experienced in surrendering himself to the overwhelming magic of light and shadow brought on by the colourful stained-glass windows. “Apart from being inspired by its poetry, I was also curious about the practical side of stained glass craft,” John starts his story during our interview at his “Artglas” atelier in Zonhoven. He is the author of one of the few enterprises in Belgium producing modern artistic stained glass panels. Voracious observers often become writers or craftsmen, and John, the creator of more than a thousand artistic glass objects, is a classic example. “The wake-up call came many years ago, when I was in my mid-twenties. I decided to follow a three-year training program on glassmaking, and hereupon then my childhood memories played a key role in the decision to specialize in stained glass. I was finally able to answer longstanding questions literally – by sculpting my own glass objects,” he recalls. After graduating at the age of 28, with almost no investments, John opened his first atelier situated in one of the rooms of his family home. The company produced simple traditional stained glass panels for ordinary Belgian farm houses. “In the beginning it was important to me that I learn every aspect of the business: from the craft of producing to dealing with employees, arranging finances and marketing”, confesses John. In the end of 90s the market changed drastically. When people thought about stained glass, they often imagined sleepy farming areas with old-school homes inhabited by the elderly. The stained-glass panels have certainly become less fashionable – a far cry from the middle parts of the 20th century, when they were seen by many as the future of interior design. The demand for John’s products started to gradually decline, and he estimated that, knowing that if the downward trend continued, in a couple of years he would get no more client orders. It was the time for the company to switch directions and revamp the business model in order to survive. In 2002 John Dierickx took a risk and opened a new company “Artglas”, short for ‘artistic glass panels’, taking into consideration two basic rules: to create the demand and turn around orders better than anyone else. 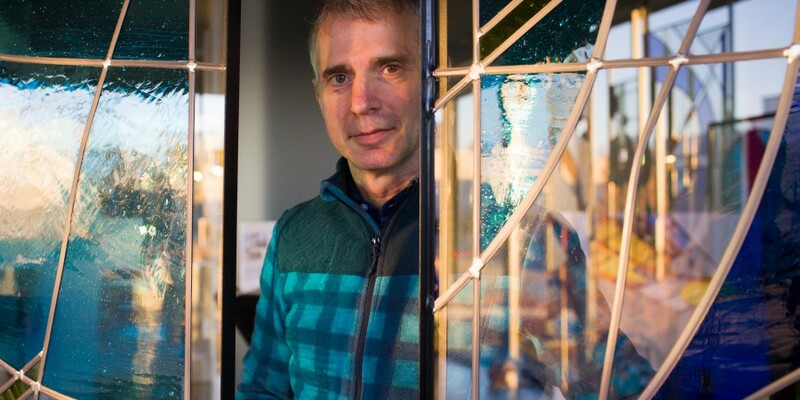 John has given a new turn to his business of stained glass: he starts developing modern designs, then focuses on making each piece a custom-made artistic work. “The beginning of this century was the right moment to brainstorm on what to do with the stagnating business and how to develop my atelier if to develop it at all. One day a friend of mine who works at Nike voiced a good idea: “We don’t follow the demand, we create it”. Well, I suddenly realized I shouldn’t follow the stagnating stained glass market, but instead propose something unique and cause making it a trend. I discovered that I could draw. I started experimenting with designs, a lot came from personal experience and memory, but also I tried to address various social values that are important. In fact, I understood why I love working with glass – because it allows me to work out abstract ideas whether metaphysical, spiritual or even how to deal with practicalities. The process of questioning and analyzing always leads me to new forms”, says John. ‘That’s how I came to conclusion of keeping the craft of stained glass alive with modern concepts”. “Artglas” designed a contemporary stained-glass window for an old mansion in Tongeren. The designers had to take into account the existing iron framework. To maximize incoming daylight, they opted for clear glass with many different structures. They mounted dim lights between the glass panel and the skylight, so that the residents can enjoy their beautiful stained glass in the evenings as well. Courtesy “Artglas”. The twin organizing principles have made the company (and John Dirckx) into a leader on the Belgian market. Very few companies can challenge “Artglas” at this moment. The company is being in competition with themselves rather than anyone else. This also earned John the quality label of Design Vlaanderen in 2012: an award in recognition of innovative designers. The team of “Artglas” accomplished this project in collaboration with the Belgian architect Vittorio Simoni. It has become an engaging blend of back to basics and design, originality and art. That is the exclusive experience which staying in cArAvAn offers. Nine old caravans were converted into remarkable sleeping quarters by local architects, designers, fashion designers and creative centipedes. They were located at a unique location, surrounded by green, yet within cycling distance from the centre of Hasselt. Courtesy “Artglas”. The production area of “Artglas” is part sci-fi atelier and part old-fashioned workshop. Inside, in the reception area, its high-gloss, bright, minimalist interiors resemble a contemporary art gallery. Backstage, behind the doors, designers work at long counters in a vast industrial open space, utilizing the centuries-old techniques and traditions. Surprisingly enough, the pace isn’t that frantic: the artists unhurriedly work on their creations. Seated nearby them is a quality control specialist, with extensive expertise and patience, Billy, the ragdoll blue-eyed cat. The true source of inner peace and serenity for John and his team, Billy inspires the company to fulfil its mission to colour Belgium’s gray skies.